Join us June 24-26 in Myrtle Beach, South Carolina, for the PFI Annual Conference - only 10 weeks away! Thanks to all who made it to the International Biomass Conference & Expo this week in Atlanta! We had a great showing by Pellet Fuels Institute members and prospective members. Anyone planning to attend Heating the Midwest in Carlton, Minnesota, the first week of May? Heating the Midwest is a regionally focused gathering of biomass heating in the region. The Pellet Fuels Institute is a proud co-host of the event and I'll be talking during the conference's first morning. Let me know if you plan to be there. Only 10 Weeks Till the PFI Annual Conference in Myrtle Beach! Register by April 30 to Get the Early Bird Rate! It’s not too early to register for the PFI Annual Conference taking place in Myrtle Beach, June 24-26! The conference is earlier in the summer than in years past, and hotel rooms are already more than half reserved, so don’t let it sneak up on you. We're building a collection of photos of our members, their pellet mills and product. Send them to Carrie Annand at [email protected]. 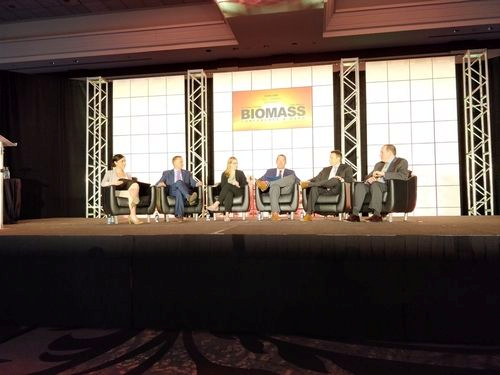 This week's featured photo is Tim Portz (third from right) representing PFI during the general session at the BBI International Biomass Conference and Expo this week. On April 18, the House Agriculture Committee held a markup hearing and passed its version of the 2018 Farm Bill, officially titled the Agriculture and Nutrition Act of 2018, or H.R. 2. The vote was along party lines, with committee Republicans voting in favor of the bill and committee Democrats voting in opposition. The bill will now be considered by the House. In a statement, House Ranking Member Collin Peterson, D-Minn., criticized the legislation, calling it "a flawed bill that is the result of a bad nontransparent process." Cuts to Energy Title programs are among the specific provisions of the bill that Peterson criticized. "...$500 million from the Rural Energy for America Program was eliminated as well as killing the energy title," he said in a statement. A draft of the 2018 Farm Bill was first released April 12. The bill reauthorizes several bioenergy and biofuel programs, but provides them with only discretionary funding. A summary of the bill released by the committee on April 18 shows Subtitle E of the legislation includes reauthorizations and discretionary funding for several Energy Title programs. How Green Is Biomass Energy? Science Café NH Will Discuss It. Here's a no-brainer: Burning wood for electricity is better than burning fossil fuels from an environmental point of view. In this era of climate change, the argument for using wood as fuel is simple: The tree will die eventually and release its carbon, so it's no big deal to release the carbon early via burning. You can't say that of coal, oil or natural gas, which would never release their carbon if humans didn't interfere. The argument is doubly strong if you plant new trees after cutting other trees down, since the seedlings will take back the released carbon as they grow. Cutting trees in a well-established wood releases more carbon than we had realized because of disruption to the carbon-containing soil and undergrowth. The difference in energy density between wood and fossil fuels - it takes a lot more wood to generate a given amount of energy that it does coal, oil or natural gas - can tip the scales. The carbon benefits of using wood-versus-coal occur over the time scale of tree generations, roughly 30 years, and that might be too long to be useful in the fight against climate change, which is accelerating faster than almost anybody predicted.